Sago (ஜவ்வரிசி), also known as ‘tapioca pearls’ is a starch product extracted from the tapioca root. 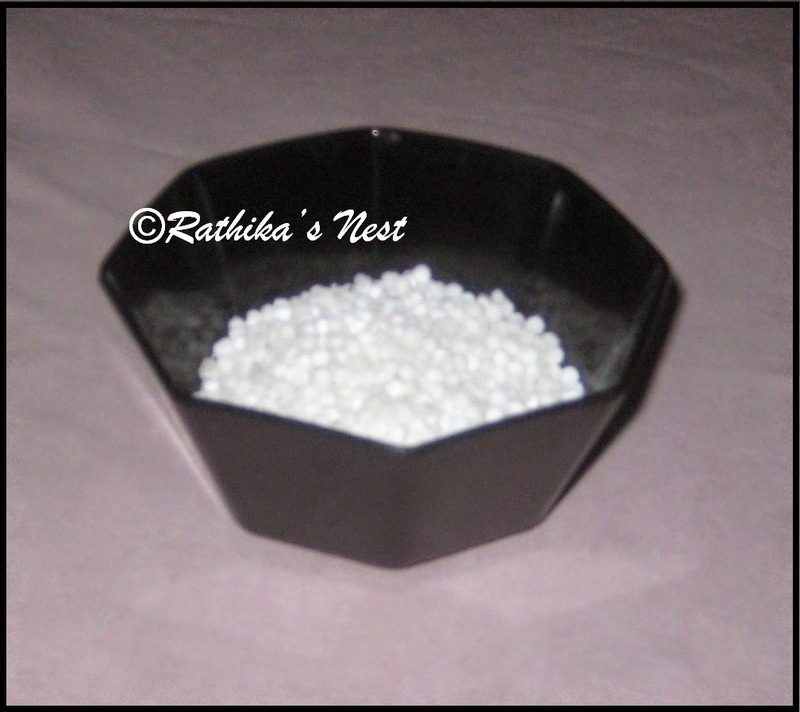 Sago, made of white pearls, is available in varying sizes. The regular sago pearls available in the market are around 2mm in diameter. Traditionally sago is used to make payasam and wafers (வடாம்). However, you can make a sumptuous uppuma using sago, and this can be served for either breakfast or dinner. I prefer to make this uppuma with vegetables to make it more interesting as well as nutritious. Let’s see how to make sago vegetable uppuma. *Carrot, beans and green peas may be used. Shell the green peas. Cut other vegetables into small pieces. Method: Wash sago well in water 2-3 times, drain and then soak in 2 tumblers (400ml) of water for 1-2 hours. Regular sago available in the market gets soaked well in 1-2 hours. However, if you are using sago with larger pearls, you may have to soak it for longer duration. Once soaked well, you will be able to crush the sago pearl easily. At this stage, drain it fully through a strainer and keep it in the freezer compartment for 20-30 minutes. Heat oil in the kadai, add mustard seeds and when they start to sputter, add split urad dhal. Fry till the dhal turns light brown. Add the nuts and sauté for 30 seconds. Now, add chopped onion, green chillies and ginger. Sauté till the onions turn transparent. Then add the cut vegetables, turmeric powder and required salt. Mix well and sauté for a minute. Cover and cook on low flame till the vegetables are cooked. Remove the soaked sago from the refrigerator, add required salt and mix well. Add sago to the vegetable mixture and blend well. Cover and cook on low flame till the pearls turn semitransparent. Switch off the stove. Garnish with curry leaves. Serve hot with coconut chutney.